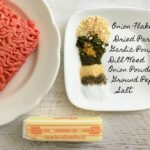 Special thanks to Shelly for taking the time to write down all the Beef and Butter Fast recipe combinations on one printable sheet! 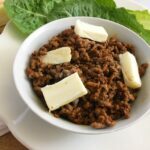 This makes it so much easier to change meal flavors up a bit when doing the beef and butter fast challenge. 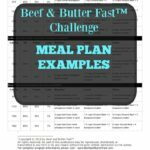 Be sure to ask a friend to do the Beef and Butter Fast Challenge with you! It’s much more fun and it helps you stay accountable! Purchase ingredients needed ahead of time. Prep your meals ahead of time. Have the mindset that you CAN complete this in only 4 days. Don’t start until you are ready to commit to the process. 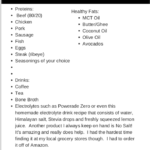 If you start to feel hungry, you are not eating enough healthy fats. You will not be hungry on this plan. Get support from the group when you feel as though you are starting to struggle. Stay active in the group. This means to comment on each challenge post that is posted that morning. 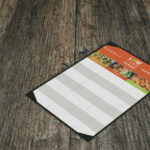 This way we can help you and encourage you! 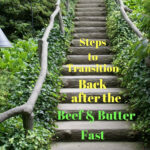 Print off the Beef and Butter Fast Substitution list so you don’t get bored with your food choices. Calculate your macros so you know about how much food you should be consuming. Here’s a video that shows you exactly how to calculate your macros. 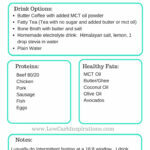 Look over the Beef and Butter Fast Sample meal plans so you can get an idea of what a day of food looks like for you! Tell yourself YOU CAN DO THIS!! Get a handy Milk Frother to help blend your butter coffee, tea, or bone broth! It makes a world of difference and well worth every penny! I have this Milk Frother on Amazon.